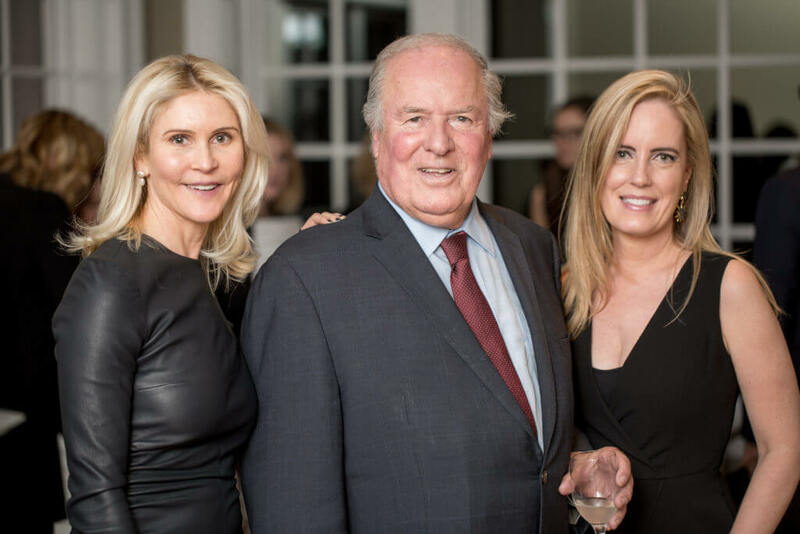 In celebration of 40 years in Philadelphia, Sotheby’s auction house partnered with Kurfiss Sotheby’s International Realty to bring an unforgettable event to the Greater Philadelphia region. Hosted at one of Kurfiss Sotheby’s International Realty’s premier properties at 353 Lewis Ln., this exciting collaboration showcased what sets Sotheby’s apart—the curation of the best in luxury, from fine jewels to majestic homes. Listing agent Hannah Griswold McFarland (left), chairman of Kurfiss Sotheby’s International Realty, Donald Pearson (center), and listing agent Cary Simons Nelson (right). Photo: Michael Hirsch. The brainchild of Kurfiss Sotheby’s International Realty top agents Cary Simons Nelson, Hannah Griswold McFarland, and VP of Sotheby’s Philadelphia, Carolyn Nagy, this extraordinary event brought the best of the auction house together with the best in Sotheby’s International Realty. 353 Lewis Ln., Ambler, PA. Photo: Michael Hirsch. With fireplaces ablaze and elegant fare butlered by attentive waitstaff, the splendid Camp Woods estate welcomed esteemed guests from the Greater Philadelphia area. A warm welcome was given by Hannah Griswold McFarland, whose family built Camp Woods in 1913. The current owner, Steven Korman, who restored and expanded the residence, spoke about the property’s vast history. Most notably, it was home to General George Washington and his troops in the fall of 1777. Mr. Korman is only the second owner of the property since before the Revolution—historic, indeed! Guests toured the home throughout the evening and tried on jewels while enjoying Sotheby’s champagne, wine, and a signature cocktail along with passed hors-d’oeuvres. Kendall Reed, Head of Fine Jewels at Sotheby’s, regaled attendees with the history and stories of these magnificent pieces. Photo: Michael Hirsch. 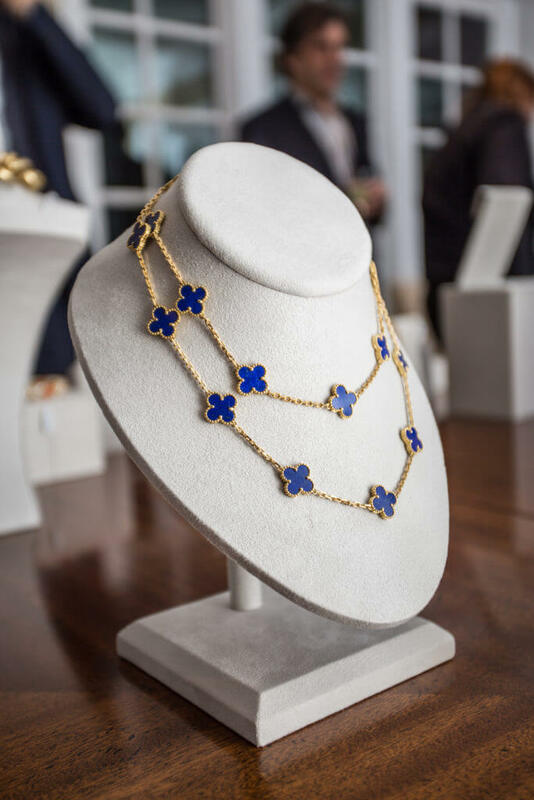 Carolyn Nagy of Sotheby’s Philadelphia office introduced the auction house professionals visiting from New York City with 44 pieces of fine jewelry, representing an array of styles and time periods from the “Fine Jewels” auction scheduled for April 19 in New York City. Among the designers represented are Bulgari, Cartier, Buccellati, Tiffany & Co., Van Cleef & Arpels, David Webb, Verdura, and Fred. 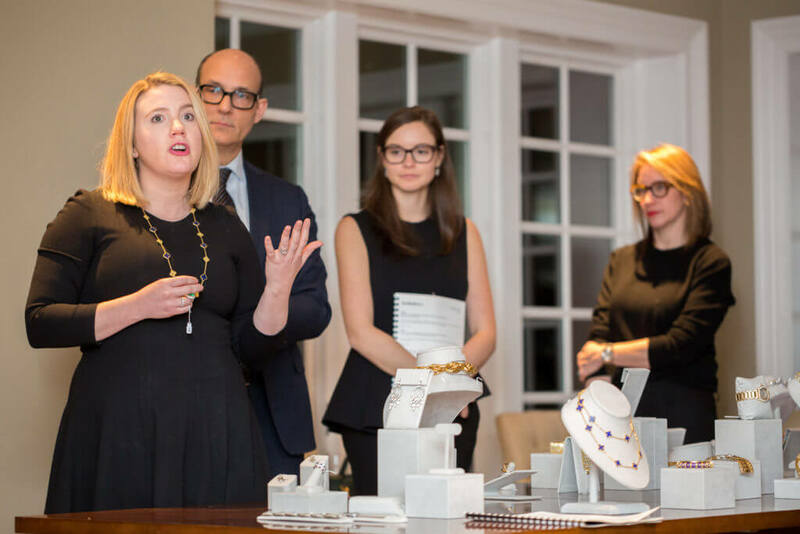 Frank Everett, SVP Sales Director for Sotheby’s Luxury Division, Kendall Reed, Sotheby’s Head of Fine Jewels, and Katherine Thomas, Sotheby’s Head of Watches and Clocks joined us for this special event. To see more pictures from the event, head to Philadelphia Style Magazine‘s feature of the event. This one-of-kind property spans over 14,000 sq. ft. of meticulously-appointed luxurious living on almost eight acres of gorgeously landscaped grounds. The estate is named after the adjacent historically significant Camp Woods Land Preserve consisting of 36 acres. Built originally in 1913 as a wedding gift for a young couple, Camp Woods has been re-envisioned and expanded by architect Rene Hoffman and custom builder, Great Estates, Inc.
Modern living meets old-world charm in this detail-rich, historically preserved yet state-of-the-art home. 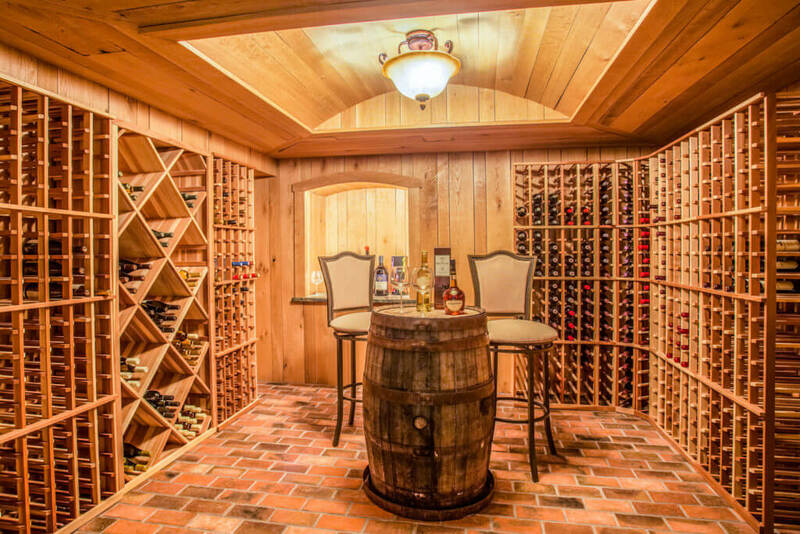 A chef’s kitchen, formal entertaining spaces, wine cellar, home theater, gym, fireplaces, elevator, dog grooming area, expansive outdoor entertaining areas with pool, and heated four-car garage are some of the many attributes of this grand property. This estate comes fully-furnished and includes an art collection curated by the owner, Steven Korman. For more about this exquisite listing, contact Cary Simons Nelson at 484-431-9019 or Hannah Griswold McFarland at 917-453-3632. “Value, value, value is what auction jewelry is about. Once you buy at Sotheby’s auction, you will not go back,” says Frank Everett, Sales Director of Sotheby’s Luxury Division. Lot #558. Photo: Michael Hirsch. 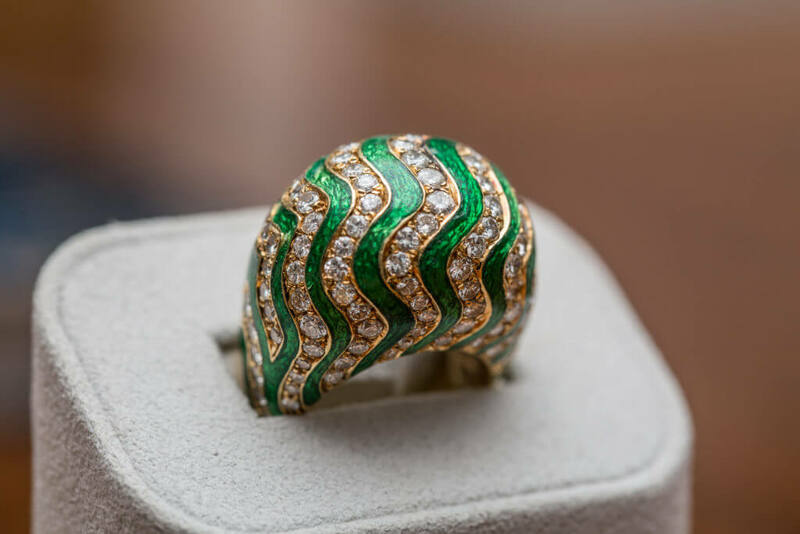 The earclips of bombé design applied with rows of green enamel accented with polished gold, signed Webb; the ring also of bombé design, applied with rows of green enamel interspersed with rows of round diamonds, size 8, signed Webb. With signed pouch. Lot #609. Photo: Michael Hirsch. Set with an emerald-cut diamond weighing 5.56 carats, size 6¼, illustrated unmounted. Lot #623. Photo: Michael Hirsch. 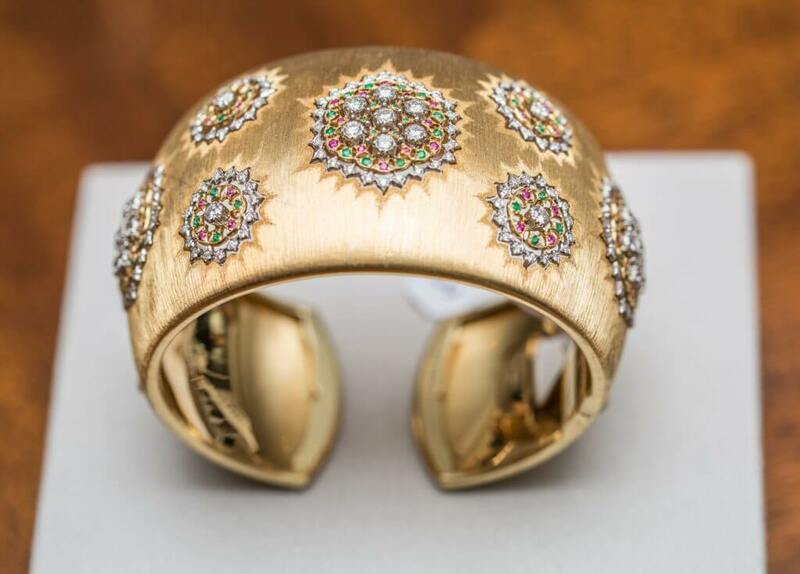 Of hinged design, the brushed gold-cuff bracelet accented with openwork floral motifs set with round diamonds, emeralds and rubies, internal circumference 7 inches, signed Gianmaria Buccellati, numbered D3050, with Italian assay and registry marks. 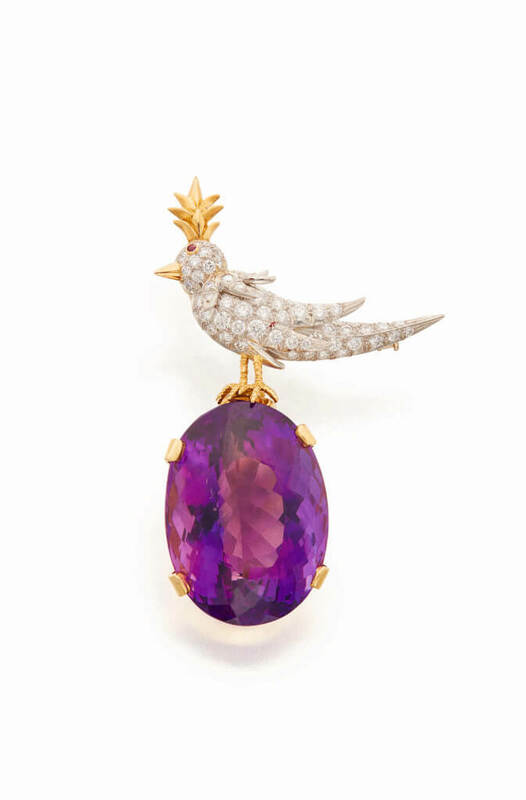 Lot #701 – Amethyst, Diamond And Ruby ‘Bird On A Rock’ Brooch, Schlumberger For Tiffany & Co.
Set with an oval-shaped amethyst, surmounted by a bird set with round diamonds, the eye set with a round ruby, signed Tiffany & Co. Schlumberger. Lot #715. Photo: Michael Hirsch. Composed of quatrefoil-shaped lapis lazuli links. 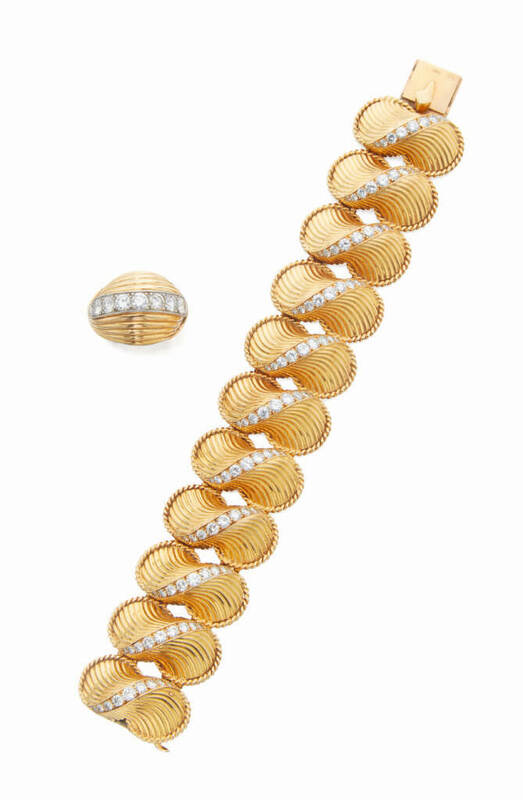 Comprising: a bracelet composed of fluted gold links highlighted by round diamonds, length 6½ inches, signed Cartier Inc., with French assay and workshop marks; and a ring of similar design, size 5, signed Cartier Inc, with French workshop mark. 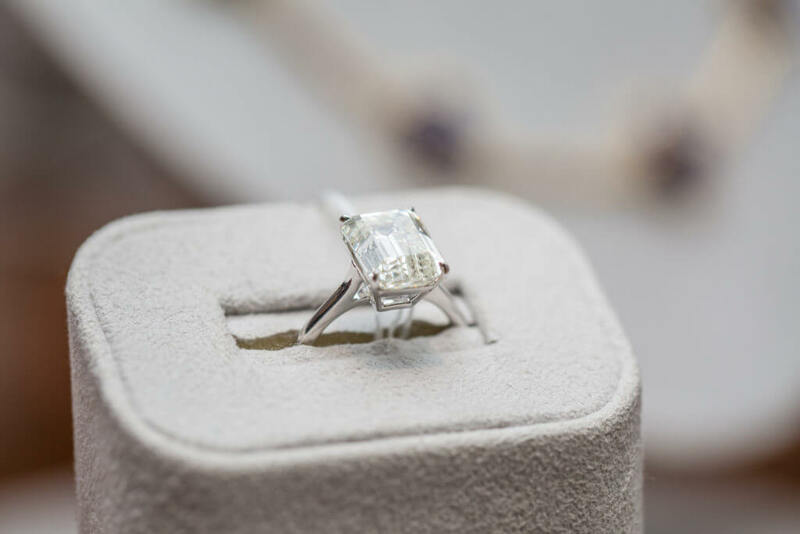 Join Sotheby’s auction house for the Fine Jewels auction event on April 19, 2018 in New York City. For more info on the auction, click here.